Explanation: Ranging throughout the solar system, these pictures all have something in common. They were taken with an 8 inch diameter telescope, a size popular with amateur astronomy buffs, and slightly modified "web cam" of the type widely used to send images out over the internet. The results are clearly remarkable for such inexpensive and readily available equipment. Each sharp image was produced from 20 to 30 frames which were digitally stacked and processed using free software. Until recently, digital imaging for amateur astronomers required a specialized camera, but the advent of low-light video surveillance cameras and web cams now presents other options for relatively bright solar system objects. 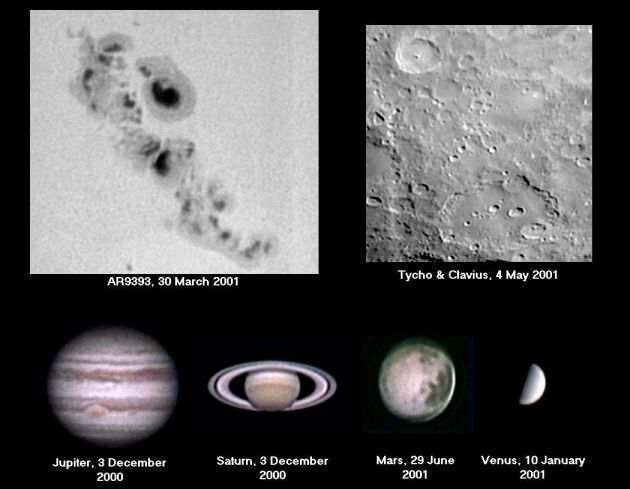 Want to try some unconventional web cam astronomy? Astronomer Geoff Chester offers these images and an account of his own adventures from a suburban front lawn near Washington D.C., USA.